Some of the highest antioxidant levels of all plant foods are found in nuts. Antioxidants are vital for helping to fight inflammation and cell and tissue damage caused by free radicals (toxic byproducts of metabolism). Nuts are also rich in fiber, healthy fats, vitamins, and minerals. Researches show they help to lower cholesterol, improve blood vessel function, and benefit muscles and joints, too. Almonds are a good source of the minerals zinc, magnesium, and potassium. They are very rich in antioxidant vitamin E, which supports the brain, the cardiovascular and respiratory systems. It also helps keep the skin healthy. They are especially rich in cholesterol-lowering monounsaturated fatty acids, such as oleic and palmitoleic acids. Their high fiber content also helps regulate blood sugar levels. Eat with their skins on, as the flavonoids in the skins work synergistically with the vitamin E to more than double their antioxidant power. 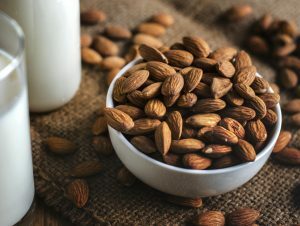 Use ground almonds as a low-starch, gluten-free flour in baking or to make almond milk, a useful alternative to dairy. A good source of monounsaturated oleic acid and omega-3 alpha linolenic acid (ALA), which are both healthy fats that help protect against heart disease and cancer. Cashews also contain calcium, magnesium, iron, zinc, and folate, making them an excellent source of minerals that contribute to bone health. These nutrients also help with the formation of collagen, which is essential for supporting healthy skin, body tissues, hair and eyelashes. 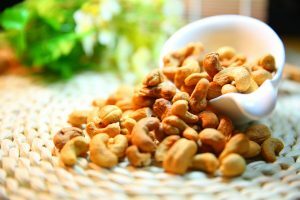 Cashews contain starch so are useful for thickening water-based dishes, such as soups, meat stews, and some Indian milk-based desserts. Cashew cream made from blended soaked cashews can be used as a healthy alternative to dairy cream. 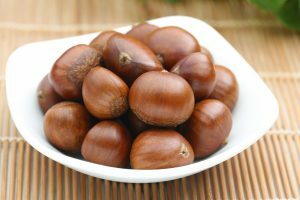 Chestnuts can be classed as the only really low-fat nut, because they contain a fraction of the calories of other types of nuts. However, they are high in fiber, beta-carotene, and folate. 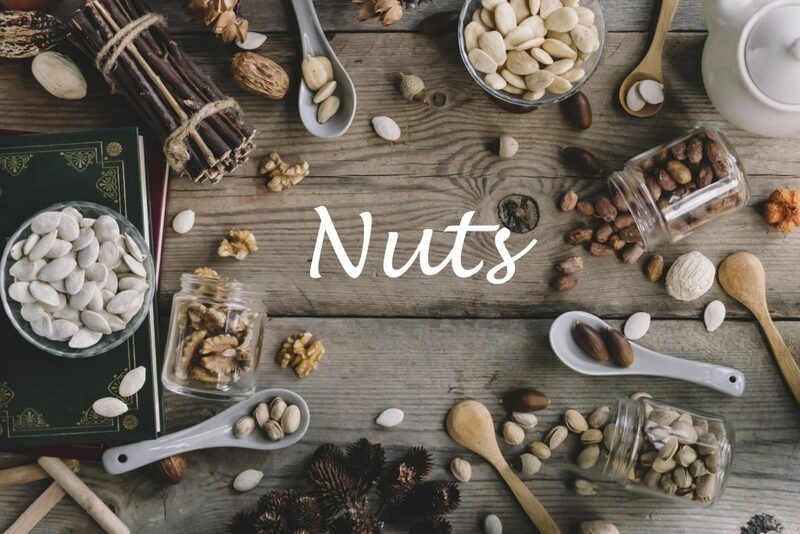 They are also the only nuts that contain a significant amount of antioxidant vitamin C. In addition, they contain high levels of palmitic acid and oleic acid, the heart-healthy fatty acids found in olive oil. Eat boiled, puréed, or roasted and added to pastries, soups, poultry, stuffings, casseroles, and appetizers. Chestnut flour is gluten-free and is used in many Italian dishes, such as polenta, gnocchi, sweet breads, and cookies. They are rich in antioxidants and high in monounsaturates, which protect the heart and help lower “unhealthy” (LDL) cholesterol levels in the blood, and vitamins E and K. Also a rich source of folate and the B vitamin biotin, which promotes healthy skin and hair, and copper, which helps build red blood cells, protects cells from free-radical damage, and strengthens connective tissues. 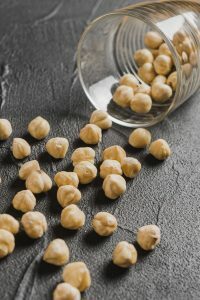 Eaten with their skins on, hazelnuts contain 3 times as much antioxidant proanthocyanidin, which helps prevent free radicals from damaging organs and cells, as other nuts. Crush and sprinkle over baked fruit, granola, fruit desserts, and savory dishes. A good source of protein Contains more vitamin K, which protects bones and arteries, than other nuts. A good source of magnesium and potassium, which help maintain a steady heartbeat, lower blood pressure, and improve circulation. 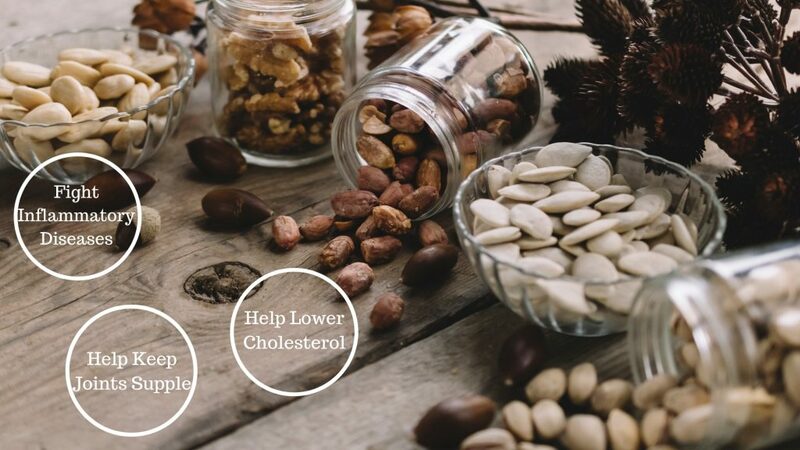 Although higher in fat than other nuts, they are richer in phytosterols, plant hormones that lower “unhealthy” (LDL) cholesterol levels in the blood, reduce the risk of certain types of cancer, and enhance immune function. 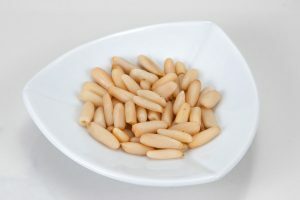 Add a handful Pine nuts added to a meal can help to create a feeling of fullness and satisfaction. Toss into hot pasta or pilaf or add to stuffed tomatoes, zucchini, or eggplants. Their vibrant color indicates a high antioxidant content. 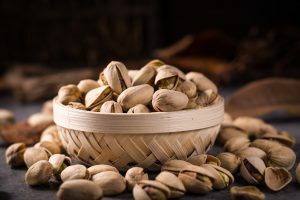 Pistachios are also high in beta-carotene and the compound oleanolic acid, both potent anti-inflammatories, and phytosterols, a type of anti-inflammatory plant hormone associated with improved immune function, lower levels of “unhealthy” (LDL) cholesterol, and a reduced risk of cancer. They contain valuable minerals, such as potassium, calcium, zinc, iron, and magnesium. Heat can reduce their nutritional value so use as a garnish, sprinkle on probiotic yogurt, or combine with nettles, dandelion leaves, and Parmesan cheese to make a detoxifying springtime pesto sauce. A rich source of alpha-linolenic acid (ALA), an omega-3 fatty acid. ALA helps lower “unhealthy” (LDL) cholesterol levels and keeps arteries healthy. 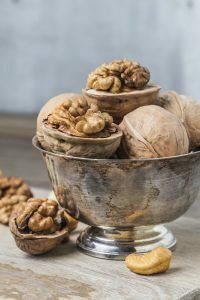 Walnuts also contain the antioxidants ellagic acid and a mix of tocopherols (the vitamin-E complex) including alpha, delta, and gamma tocopherol, which help reduce the risk of cancer and heart disease and maintain skin and tissue health. In addition, they contain serotonin, a brain chemical that can help lift depression. Use in stuffings, baked goods, as a topping for fruit and yogurt, or in salads.